It is way past time to adopt a zero tolerance policy for "birthers." This is a 100% racist movement that attempts to argue that President Obama was not born in the US. Despite the mountains of evidence that prove he is a US citizen - including his birth certificate which has been online since 2008 - these people keep wanting "more evidence" and keep raising new, nonsensical claims about the president. Lt. Col. Terry Lakin, an Army physician, has refused to obey any orders from his commanding officers -- including President Obama -- until Obama produces his birth certificate. 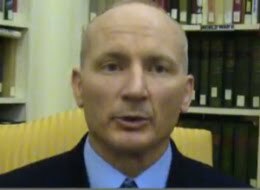 "Any reasonable person looking critically at the evidence currently in the public domain would have questions about President Obama's claim to be a natural born citizen," Lakin says in the below video released the right-wing American Patriot Foundation. "I will disobey my orders to deploy [to Afghanistan] because I, and I believe all servicemen and women and the American people, deserve the truth about President Obama's constitutional eligibility to the office of the presidency and the commander in chief." Lakin says this marks the first time during his 18 years in the Army that he has chosen to disobey "what I believe are illegal orders." Evidently he didn't feel the need to personally verify the citizenship of his three previous commanders-in-chief. He won't obey his orders, then send him to the brig. He does NOT have anything resembling a legitimate reason to disobey an order from the commander-in-chief. Frankly, if you disagree, then you, too, are a racist idiot without a legitimate point of view. End of story. You have every right to disagree with Mr. Larkin, but I find your quickness to assign a motive of racism as the cause for his disobedience as somewhat premature. Do you have any evidence that he is disobeying because of Obama's race? Seems to me he is disobeying because he doesn't think that Obama is legitimately and Constitutionally qualified to be president. No mention of his race was ever mentioned, was it? Again, is everyone that disagrees with Obama automatically a racist, Dave? Not at all, and I have never said so. But what exactly are his "legitimate" reasons for refusing his orders? Did he ask for personal verification that the previous two presidents he served under - Bush and Clinton - were born in the US? Did he require that he be the sole determiner of whether one is constitutionally eligible with them? Than why does he require that now? It is obviously not a Democrat vs. Republican thing, as he served under Clinton. It could not be that he doesn't believe the wars are legitimate, because they were started by Bush, and he was okay with it then. So what is different now? Right, it's the black guy giving the orders. To refuse to see that as the reason (or even hold open the possibility that it could be the reason) defies all logic. My overall point is that I am now enacting a zero tolerance policy on birthers. There are NO legitimate questions left to be answered regarding the issue of President Obama's eligibility. None. To say he hasn't shown his birth certificate is simply not true. He was sworn in as president by the Chief Justice of the US Supreme Court. The US Congress ratified the results of the electoral college. He IS the president. So, what makes this a legitimate reason to disobey orders, and what could his motivation be if not racism? Why does an irrational belief that the president is not really the president allow him to refuse orders, in your opinion? And since there have already been similar challenges before this and they were all dismissed, why does this one deserve special treatment? Did you ever serve in the Military? Are you possesion of an Honorable Discharge? If not, than shut your trap. This guy has 18 years in Military Service. He has earned the right to say whatever he damned well pleases. First of all Eric, whether or not I served in the military is irrelevant. I have just as much of a Constitutional right to my opinion as you do. No one, including me, is trying to deny him his free speech. But he does not have the freedom to decide, on his own, that the President of the United States is not really the president, and that he can disobey any order he chooses. Also, there are different standards as to what can and cannot be said about the Commander in Chief when you are active duty, correct? Certainly making a baseless claim about the CIC's birthplace might qualify as disparaging. Mr. Larkin chose to go public with his campaign to attack the president. He was not forced. My opinion that he is a racist douchebag still remains. You are unconvincing, sir. The difference, Dave, is that there was never any question and attached controversy as to Bush's and Clinton's legitimacy to be president. Whether you think the evidence is incontrovertible that Obama is legitimate is not the case. I agree with your conclusion that Obama is rightfully president, but then you also wrongly think that man-caused global warming has incontrovertible evidence too. I still think Mr. Larkin's motives are exactly as he claimed and have nothing to do with racism, until I SEE evidence to the contrary, sir. there was never any question and attached controversy as to Bush's and Clinton's legitimacy to be president. And there isn't one with President Obama, either. This is a made up controversy. This man does not, under any circumstances, have a legitimate point that he can disobey orders from the President. That is the only relevant factor. Period. No matter what his motivation, it does not matter. But I am sticking with racism until I SEE evidence to the contrary, sir. And, there was an issue as to Bush's legitimacy. Many feel (justifiably in my view) that he was not elected president in 2000. He was selected by a biased Supreme Court. Now, I know you disagree with that characterization. But would a soldier have had the right to refuse to go to Iraq based on his "theory" that Bush was not really president? I guarantee you would not be defending his refusal, and you would call him every name in the book. Just because someone has some crazy theory - 9/11 was an inside job, JFK was killed by LBJ, Global warming is a hoax - does not mean that everyone else has to take it seriously and consider it a real issue. There is no issue with Obama here, the issue is with this jackass of a soldier.